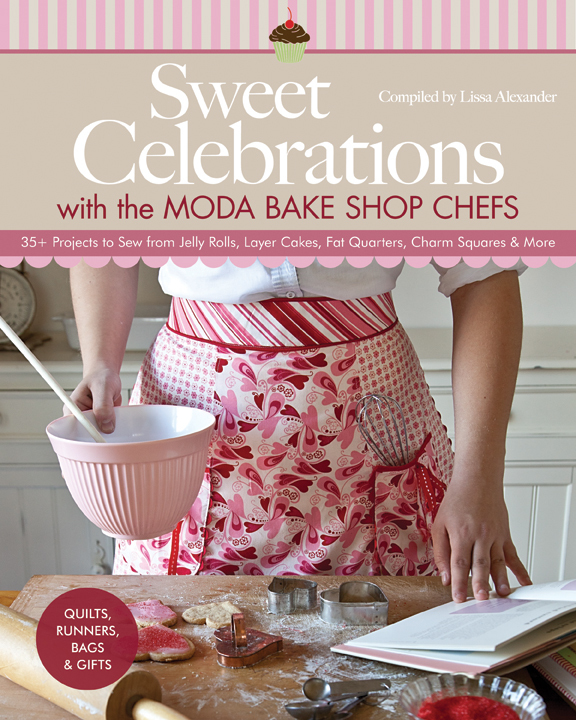 We are very excited to announce the second book in the Moda Bake Shop series, Sweet Celebrations, published by Stash Books. Following our first book, Fresh Fabric Treats, this book also has exclusive quilts and projects from your favorite Moda Bake Shop Chefs that cannot be found on the Moda Bake Shopwebsite. Join in on the celebration and learn a little more about each Chef featured in the book. Plus get a sneak peek of some of the projects and quilts that you will be able to make yourself. With easy to follow step by step instructions with pictures, it is great for any sewing level. Be sure to visit each blog and collect the recipes along the way to put with your book so you will be prepared for every occasion! Plus you won’t want to miss the giveaways that will be at each location. YUM! October 14 – Readers have until midnight on the 14th to comment on all the blogs for the giveaways. October 19 –Winners announced on all the blogs. Leave us a comment and YOU could be a lucky winner of your own copy of our Sweet Celebrations book PLUS a Moda Fat Eighth Bundle! Looking forward to seeing some great projects from this book! This is great news – can’t wait to see the inside! Another book! Awesome, maybe some day I will be in one of them 😀 Congrats to all the authors, and I cannot wait to see it! I love the Bakeshop, so a Bakeshop book is right up my alley! Can’t wait to see more! Can’t wait to peak inside. I have the first book. Moda Bake Shop has been such an inventive and inspirational idea. Thanks for the book. so exciting. i love celebrations. Can’t wait to see all the previews! Looking forward to viewing the book. The book looks great andthe hop will be fun! thanks! Already I like the apron on the front cover of the book!! love the first book, I’m sure this one is just as wonderful! Looks Amazing! How do I get one? I am very excited about the book. It looks like it is full of great patterns. Thank you for the contest. The book is sure to have LOTS of great ideas in it. I would be happy to give it a good home! Very excited to see all of the sneak peeks inside the book that we will get along the way! Sooo excited for this book!!! I love Moda~!!! This looks like such a sweet book! More reasons to buy fabric and make gifts! Fabulous! Looks like one SWEET book!!!! Looks like an amazing book. I love all the inspiration I get from the bakeshop! The book looks like lots of fun! I love having handmade things out for the changing seasons and holidays! I can’t wait to see all the awesome projects! Looks like a great book for gift making! Toss my name in please! I can’t wait to see the book. I love making things with Moda precuts! Thanks for the chance to win. Can’t wait to get my copy! Thanks so much for the giveaway! Yeah! I’m excited for the tour! Congratulations on the 2nd book! This book looks amazing! Would love to win and if not, can’t wait to get a copy. Sounds like a interesting book, would love to win it. The book looks awesome! Congratulations to moda and the authors on their second publication! I love sewing things for different holidays. Can’t wait to see what’s in the book! The book looks fantastic! Would love to have my own copy! This book looks amazing and I’m excited for the blog hop tour! Thank you for the chance to win! Another great book in the baking side of quilting! This looks like a book I would love! This should be a fun blog tour! I love all the categories mentioned. Can’t wait to get my hands on it. Moda is the best! Really looking forward to following along on this blog hop. The cover is beautiful and I am sure the inside is equally as fabulous! Loves like a fun book. Thanks for having the giveaway. What a lovely book! I would love to have a copy. This book looks very enticing! Can’t wait to peek inside. YEA! Blog hops & giveaways are my favorite! Thank you! That new book looks to be full of the most “delicious” of recipes. I can’t wait to see more from Moda! I can’t wait to get my hands on a copy of this book – it looks like a lot of fun! Looking forward to the blog tour and hearing more about the book! Ready to “bake up” a whole bunch of new projects, looks great! I loved the Fresh Fabric Treats book, so i can’t wait to get my hands on this one! I cannot wait to see this book in person! QUILT BOOK + MODA FABRIC = JOY! I can’t wait to see this book! Moda fabric too…how fabulous!!! I’m looking forwards to getting my hands on a copy of this book! Wow! the cover looks good enough to eat! Looks like we are all in for a real treat with this book! This new book looks exciting! I loved the sneak peeks I saw at Stash Books! This is such a great idea for a book! I am looking forward to seeing more. Oh, I would so love to own this book! Thanks for the chance! Oh this looks like “sew” much fun! Thank you for the chance to win! Looking forward to the release of this newest book. I would love to win this book AND fabric!! Thank you for the opportunity! Great book! Thanks for the opportunity to win. Looks great! Excited to see it! Well, this looks like it’s going to be great fun! I love the apron on the cover! the bake shop is my go-to place for quilt designs – i can’t wait to get a hold of a copy of this book! I am really in the mood for a Holiday Project! The apron on the cover is super cute! I discovered Stash Books recently. Bought 3 books already. Am loving them & would enjoy reading this book too. Thanks for the opportunity to win what sounds like a fun and informative book. I’m so excited about the new book -loved the first one! I visit the Moda Bake Shop every day to see what’s cooking. There’s always something yummy. What fun! I can’t wait to get a look at that delicious book. Looking foward to all the fun we will have with this blog. Thanks for the hop. This really looks like a fun book. What a great book….would love to win! I loved the first book, so will have to order this too. LOVE the cute apron on the cover! Thanks for a great giveaway! love the bake shop! i’ve made a few patterns from there. having the book, though, to thumb through would inspire me to work a few more recipes. thanx for the chance to win a copy and the bundle to make a recipe with. I can’t wait to see more about this book. I love the Bake Shop, and Moda fabrics. Perfect combination! Oh…. taht’s a yummy cover for a baking book! 😉 I hope to get my hands on a copy and a bundle to start baking all those colourful and elegant recipes!!! I enjoy books with projects by multiple designers because they offer such a variety of styles. I expect the blog hop will be very inspiring. Thanks for the chance to win the book! can’t wait to see what the projects look like! looks great! I love your projects! Looks like another great book. Looking forward to the blog hop and the sneak peeks! I’d love to win this book! Looking forward to all the hops to see what is in the book. This is my kind of book – can’t wait till I can get it. Exciting! The book looks great and can’t wait to get my grubby hands on a copy. I bet I could bake me some Moda projects up. I have been collecting Moda for a year now, I just need the patterns..
Oh this book looks so fun!! I can’t wait to see it!! Thank you for so much fun!! A Moda book and Moda fabric together…HEAVEN!! This is going to be so much fun! Thanks for a chance at the give-away. I love all the patterns on Moda Bakeshop. A book full of wonderful patterns and ideas is just icing on the cake! This book looks great!! I can’t wait to see it. I LOVE all things MODA!! I’ve been looking forward to the release of this book. I love the Moda Bake Shop tutorials and imagine I would enjoy this book too. Thanks for the chance to win a copy. Looks like a really fun book! Like all of your patterns! Sweet is right! Add my name to the giveaway! Book looks great and fun. I am a brand new quilter but have been thrilled to find your blog and products. Please add my name to the giveaway! Oh this is fun! Thanks for the bloghop! I am looking forward to discover the sweet treats! I love the Moda Bake shop so I know I’d probably love all of the patterns in this book! Obviously another book that I NEED. Oh wow! Can’t wait to get my copy of this book. Thank you Moda. Made several projects from ‘Fresh Fabric Treats”. Can’t waid for this new one! Thanks for the giveaway. How fun! Thank you for the chance to win! I can’t wait to own another Moda book. I loved the last one and am sure I will love this one. Oh what fun! Thanks for inviting us to join in the fun. I’m excited about this book. It will be a lot of fun! Thanks for putting it together! What a wonderful giveaway! Love the Moda Bakeshop!! I love all things Moda, incuding this book “Sweet Celebrations”. Looks like a great follow-up to the first book. Can’t wait to see all the porjects in this new book. Thanks so much. I love these blog tours because I get to find and enjoy blogs that I never new about. It is a wonderful idea ! I am checking out MBS every week – so your new book sounds perfect! Thanks! Thanks for the giveaway, looks like a great book. Precuts are the trend of the future, or rather, the future is here and it’s Precuts! So this book would be an excellent source for great patterns. Food and sewing what could be better! Looks like a must have!! I want, correction I need that! Please let it be me that wins. I’ve been waiting anxiously since you first announced the book coming out. Can’t wait to see more! Can’t wait to see what’s inside this book. thanks. enter me please. I love Moda fabric! Thanks for the recipes, and the book preview. It would be grand to be a lucky winner of this giveaway. Wow! Love the first book! Can’t wait to get a hold of this one! Thanks for a chance to win! I look forward to a great blog hop. Looks like a great book with lots of fun projects. I would love this book. Thank you for the chance to win it. I just love hops!!!!!!!! This book is on my wish list – hope I am lucky. looks like a super delicious book any fabric lover would adore to have in her arsenal – esp me! hope I win! The book looks great! Love new ideas and fabrics. Thanks for the chance to win! I’m sure this is going to be a great book! Love the look of the new book! Great giveaway and I look forward to the rest of the blog hop. This book sounds awesome! Thanks for the opportunity to win one!! I am anxious to see some of the projects in the new book, and checking out some “new to me” blogs. Thanks for sponsoring another great blog hop! I’d love to add this book to my library- and add some fabric to my stash. Thanks for the giveaway. Woohoo ! Can’t wait to peek inside a copy of this book ! Looks like another winner of a book! Thanks for the chance to win! I’m rubbing my hands together and thinking of what I could sew with a Fat Eighth Bundle. Oh the joy of just thinking about it! This looks like such a fun book! — I am looking forward to the different blogs! I surely need this book! I have precuts that I’m not sure what to do with. The book looks like it is wonderful. I love Moda pre-cuts and can’t wait to see the new book. Thanks for the the chance to win a copy of the book and a fat quarter. This is going to be fun! Would love to be a winner!! Sounds great! Looking forward to visiting all the blogs! I love Moda Bake Shop patterns! Thanks for the variety of designers and fabrics you share/show! Sounds like fun. I look forward to learning more about the new book and fabrics during this hop. Thanks for the giveaway! Love Moda fabrics and the Moda bakeshop. Hope to win the giveaway. I’ve been looking forward to the release of this book since I first heard of it. Thanks for the chance to win a copy. I would love to see this book here in OZ sooner rather than later, it will make it here sometime in the future. What a treat it will be to read! Thanks for the opportunity to win…love anything Moda! The book looks awesome. Hope to win it so I don’t have to buy it. Thanks for the chance. I love the first book and am looking forward to see the new one! Which project to make first? Fun blog hop! Love the idea of a book focusing on celebrations throughout the year. Sweet Celebrations, a very sweet treat indeed! Thanks for the opportunity. What a great giveaway! Thanks for the chance to win a copy of one of my favorite books. I hope it will become a yearly publication. I loved being part of the first book. I love Moda. Working on a quilt right now. Looks like a great book. Would love to win! Projects for a beginner? That sounds perfect for me! I get such inspiration from Moda Bake Shop. Thanks for offering. Looks like a fantastic book and I would love to win. Thanks for the chance to win. I just Love blog hops! Every morning I have to run and find out what exciting things I am going to learn today. This book has to be one we’ll all want to have. I know it’s already on my list of books to buy this Fall. This looks like a fabulous book! Thank you for the giveaway! Looks like a fun book to own! The book looks great! Love the blog hop too! Looks like a great book. Would love to try it. Thanks for the opportunity on the draw. Looks like something could definately use! I love this website! Great giveaway. Looks like a great book! The blog hop is going to be a llot of fun! Oh, that book looks like so much fun! And fabric too-what a great giveaway! Sooooo excited for chance to win this book (& Bundle!!)!!!! Thanks for chance to win!! 🙂 Wooohoooo!!! Can’t wait! Looks like a winner! Would love to win, looks like an amazing book. I am looking forward to seeing all the projects in this new book. The cover is so inviting. Looking forward to making projects from the new book. Thanks for a chance to win! I can’t wait for the book to come out. I hope I win! The designs in this book are gorgeous. I can’t wait to get my hands on a copy! you all are a talented group. You are always coming up with great fabric and projects. Thank you so much. Looks like a great book! Congrats!! Wow! I just love all the sweet products Moda brings to my quilty world! I cant wait to get going on another Bakeshop recipe. You are the best! Thank you, Moda!! Your designers are inspirational and I love the ideas in the Bake Shop. The opportunity to win a book Sweet Celebrations is wonderful. Fun fun fun! I am excited about the book and the hop! I’m having so much fun visiting the blogs in this hop! Thank for for such a delightful party and giveaways! I’m so impressed by this lovely book. Thanks for the chance to win! I love moda precuts and would love to win the bundle and the book. Thanks for a chance! Wow, just in time for Christmas… I see some great projects! Pick me! I loved the first book and can’t wait to have this one as well. Such fun receipes! Looks super interesting! Those cushions with the fig tree fabric are so beautiful! I think I would LOVE this Sweet book!! Can’t wait to visit all the blogs on the tour. This book looks great. I have the 1st one and I love it. Thanks for the giveaway! This book looks really cute. Thanks for the chance to win a copy. Looks like a great useful book! Can’t wait to see more. It would be great to win this book!!!!!! I look forward to seeing this book and the great projects! The book looks like lots of fun! I’m in. What a fun book! I’d love to win a copy. 🙂 Thanks for the opportunity! I’ve just been hopping to catch up, and this looks like a fantastic book! So fun to have recipes at all of the blogs, too. I love all things Moda, and this newest book looks like something I would love. Thanks for the chance to win. I love sugar free deserts! Thanks for the chance to win a bunch. I just love all the bakeshop “recipes” so I know this book will be well worth getting my hands on! How fun. Thanks for the chance to win. Love, love, love this book and Moda fabric is my BFF. Thanks for the giveaway!!!! I love Moda fabric. Sometimes I forget there are other fabric companies! Wow! Great giveway….who wouldn’t want to win a nice book and some fabric! The only thing better than a great Moda Bake Shop Recipe Book is one that comes with Fabric too. Thank you. If I don’t win, this book is definitely going on my Christmas Wish list (if I can wait that long!). Great giveaway. That apron on the cover is very cute! That’s a good sign! This looks like a fabulous book. Just looking at the cover makes me want to get a copy and start sewing. Would love to win a fun new book and fabric is always fun. Thanks! I have several seasonal quilted table runners that I switch out all the time. I’m still working on the bigger quilts. I love the whole sweets/baking idea in Moda — combines 2 of my loves! I love Moda blog hops! Looks like a great book to indulge in. Thanks! I love the idea of collecting recipes along the way, fun idea! Seems like it is going to be an awesome book full of fun projects. Hope I win and thanks. Looks great! Thank you for the chance 2 win! I would hate to have to choose between keeping my fabrics or keeping my books. Enjoying this blog hop. One book that would be nice to have. Thanks for the giveaway. Oh yes, more yummy fabric and a great book!! I love MBS, and this looks like a fabulous book! Would be thrilled to win this wonderful book, Thanks! I am really looking forward to seeing this book! Thanks for thegive away! Sweet! I would love to win this book! Thanks so much for the chance to win! I love all the cooks that you’ve brought together on these projects! I can’t wait to see the book. This is my first blog hop and I have been having a blast! Thanks for doing this. I’d love this as an introduction to free motion! This looks like a FUN book with lots of great projects! Thanks for the giveaway! Hope I’m a winner but, if not, I’ll definitely be getting my copy of the book. It looks wonderful! Looks like a fun book! Thanks for a chance to win. I can’t wait to see the book! I looks great! I love the look of this book! I do like craft books, but this one looks particularly lovely! I could use some new fabric sounds like so much fun!!!! This is such a great giveaway. Thanks for the chance to win! Tis is a great way to get introduced to a lot of great blogs! Would love to own this book. Thanks for the opportunity! Thanks for the chance to win a great giveaway..
Love the gracie bag! I can’t wait to try something similar. Fabric and patterns – great giveaway! I am sooo loving visiting everyone and finding out more about them! So much fun…thanks Moda! What wonderful fun! I’d love to win so pick me … Thanks for the chance to win and for all the fun of this blog hop. This is like when my kids start making their Christmas lists in October. I may need to start one with this book at the top of the list! I love almost all the moda lines! I am thankful for Charm squares and Candy, so i can have more of the fabrics for my own! Thanks for the Blog hop. I really enjoy them and find so many new blogs to follow! Can’t wait to see your new book! the book looks great! thank you Moda!! WOW! This book looks great. I look forward to learning more about the new book and fabrics during this hop. Thanks for the giveaway! Oh, this book looks like a real joy to add to my library. Thanks for the giveaway..
That book looks so amazing. thanks for this give away ! This book looks like so much fun. Going on my Wish list for sure. Looking forward to some sweet projects from this book!!! Great giveaway! This book is on my wish list. Oh how I would Love to win this book, its looks absolutely too fun!!! this has been so much fun…thanks for the chance! I would LOVE to get my hands on this book and on my a Simply Color Eighth Bundle would be amazing! THanks for the great giveaway! Love the idea of projects focusing on different celebrations, and to learn more about each chef! This books looks great. I’m always looing for moew fun stuff to make! Thanks for the recipe and giveaway! Would love to win! Wow this book looks great! Thanks for the giveaway! The projects in this book look amazing, as do the recipes! Wow! Everything from Moda is so special! I’d love to win, but will definitely purchase it if I don’t. This blog hop has been great fun , a great way to meet all the designers…thanks! This was one of the best blog hop. THanks for all you guys did. I am in love with the projects I’ve seen in the book so far! Thanks for the giveaway, this looks like such a fun book! I check the Moda websites on a weekly website. It inspires me with new ideas from others and even to create my own. The creative mind is a beautiful mind and people should be proud of what talents they have. Thank you to everyone for sharing. I’m loving the book, and the info about the bakers. Great job! I am loving this blog hop! This is the first one I was ever fortunate enough to get involved in while it was still happening and not after! Not loving the ‘prove not a robot thing’. Takes me forever to find one I can read and then another forever to actually get it entered correctly. I’m hoping to win a copy of this book so I can sew up some sweet treats for Christmas! This is one book I’m really interested in. Thanks for hosting the giveaway. what a fun blog hop! and i am loving the recipe cards each step of the way! How Fun! Thanks for doing a giveaway. Oh my, I really need this lovely book to my collection! Thanks for the giveaway! Visiting all the participation blogs has been so inspiring.